Looking for a chocolate-heaven-like dessert to serve at our Thanksgiving table, I found this Chocolate Pecan Pie recipe in Ricki Heller’s cookbook Sweet Freedom. She also has it online for free, here, but everything else I’ve tried from the book is delicious so it’s definitely worth checking the full cookbook out. The recipe wasn’t quite perfectly matched to the diverse dietary restrictions and needs that our guests (and myself) required, so I took the liberty of making a few minor changes. Simply, I switched the spelt flour in the crust recipe with an equal combination of sorghum and brown rice flours, making it gluten-free. Then, because I’m not eating refined sugars right now, I used unsweetened baking chocolate instead of the chocolate chips in the filling, and I used almond butter instead of cashew butter to adapt for one of the nut allergies. What I got was just what I was looking for: A rich, heavy, purely decadent chocolate dessert that would fulfill any chocolate addict’s cravings. 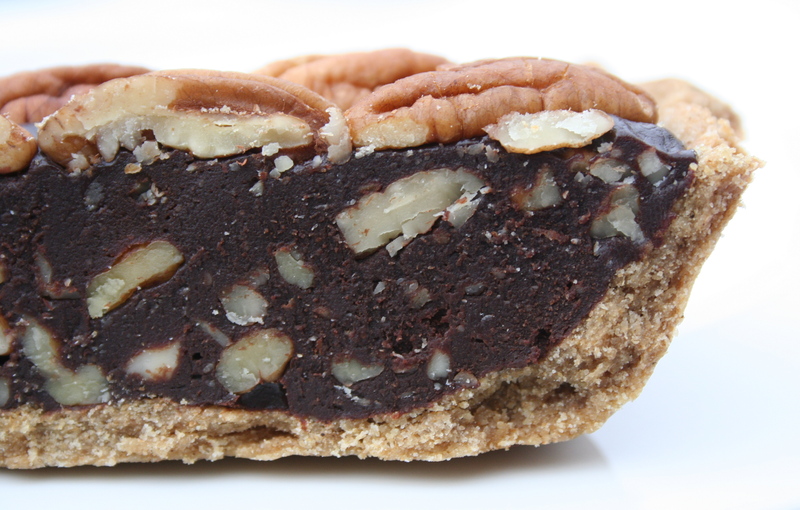 It was also gorgeous, especially when cut into slices and the pecan pieces shone bright in the midst of all the dark chocolate fudge. If you are looking for a holiday dessert, or really any type of chocolate treat, this is definitely the recipe to try. I fully recommend it! I hope everyone had a nice Thanksgiving holiday yesterday, filled with family and friends, and of course lots of delicious food. Based on my own experience, I suspect that you stuffed yourselves, although hopefully not as much as I did! But, however full I felt last night (and still this morning! ), I always enjoy looking at more food, so here is a sample of what I made and ate last night. 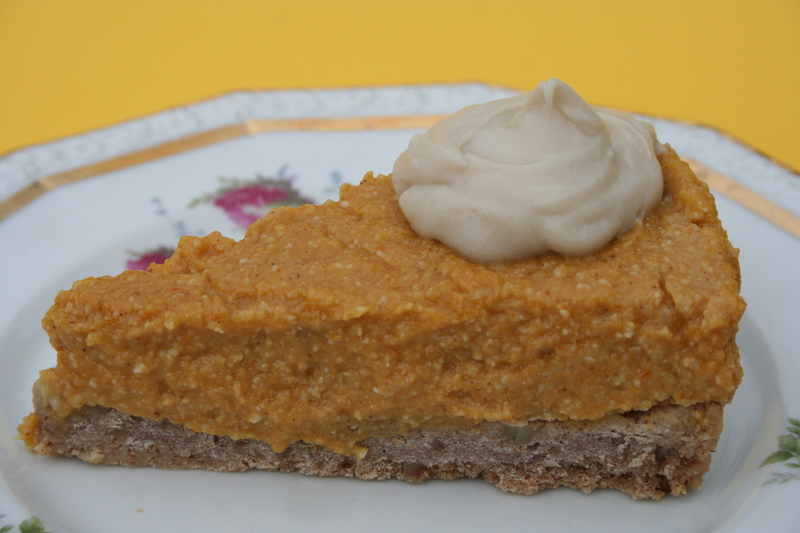 For our feast, I made a Pumpkin Cheesecake and topped it with a rich Whipped Coconut Creme. It tasted quite delicious, although definitely more like a pumpkin pie than a cheesecake. I think if I had used a Vitamix or a more powerful food processor, I could have gotten the filling to have a more even consistency (like the one in the original recipe’s picture, here), but nonetheless it tasted great. 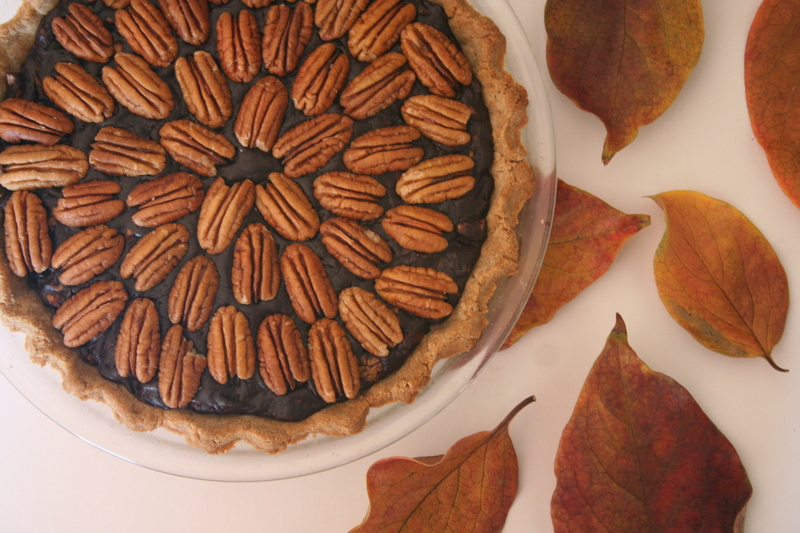 It had a wonderful pumpkin taste, and the pecans in the crust complemented the fall flavors very nicely. We had a little bit of extra crust dough that I baked separately, and it ended up thick and tasty as a simple shortbread-like cookie on it’s own. The coconut creme was from a recipe in Sweet Freedom, for a sugar-free, gluten-free, soy-free vegan whipped cream. Dolloped on top of the pie, it was rich, sweet, and certainly very creamy, but not as light and fluffy as whipped cream should be. Our consensus was that it would have been very good as a fruit tart filling, and next time I make one I will definitely use this recipe! Last week I visited my dear friend Sara in Humboldt County, where she recently started a lovely farm! She has a huge garden that I got to dig my fingers into, and plant all sorts of squashes and salad greens. I had a great time sweating it out in her hoop-house green house where I planted the squashes (we even planted a type of decorative winter squash called a “Red Warty Thing“, which is unusual and exciting), and I got to feed her 11 chickens. I may include some pictures of them in my next post, so watch out! Anyway, back to my baking adventures…It seems that everywhere I go, it is blueberry picking season! Humboldt was ripe with these juicy berries, and together we picked a bucket full. It was the beginning of the blueberry season here in California (unlike when I was in New York, where the berries were busting out all over the place), so the berries we got this time were on the tart side. Perfect for baking with! 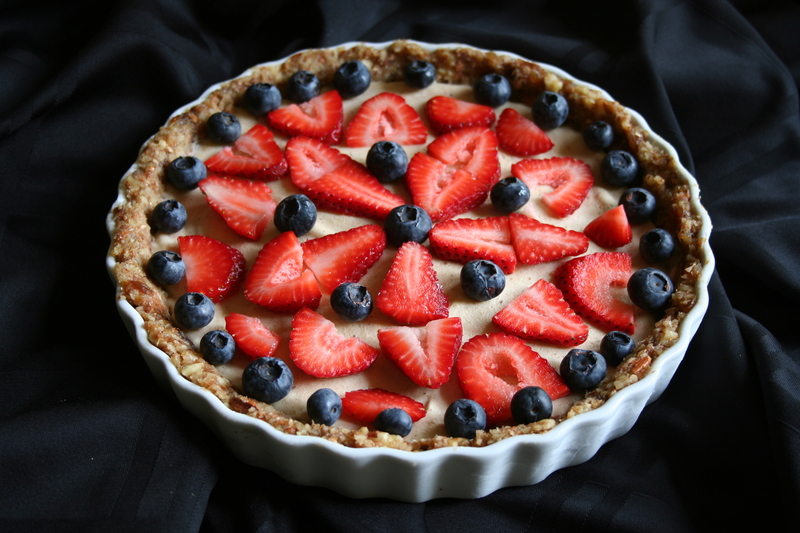 This is a pretty basic recipe that I made up on the spot; it was really nice with the fresh-picked blueberries, since their tartness balanced out the sweetness of the topping. It’s an easy and quick fall-back recipe, and is one that you can play around with quite a bit. You can add to the fruit filling with whatever fruits you have around the house, like apples, any sort of berries, or even banana is good in a crisp. You can also add to the topping however you want by mixing in chopped nuts or granola – this would give an added crunch and texture, and throwing in a pinch or two of nutmeg or cloves would give it an extra spicy punch. Mix together your blueberries and peaches and add the orange juice. Combine only till fruit is coated; you don’t want to over-mix and crush your berries. Pour into a 9×13 inch pan. Set aside while you mix your topping ingredients. In a medium bowl, cream together your Earth Balance and sugars. When they are nice and fluffy, add in your flour, baking powder, and cinnamon. Mix till just combined. Add your oats last. You may have to mix these in with your hands, depending on how thick your dough is at this point. 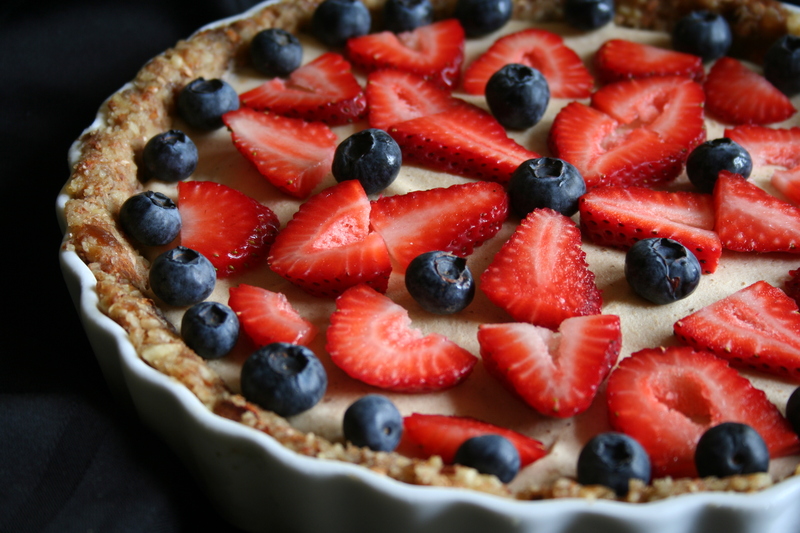 Sprinkle on top of your berries and stick the whole thing in the oven for 35-40 minutes, until the top is golden brown and crispy. If you let it sit to cool for a bit, the filling will firm up and be easier to cut or scoop. It’s nice to eat warm, but can also be heated up later. The next item in my unintentional blue-baking series was a delicious blueberry pie. It all started when my friends wanted to get out of New York City, and drive up to the countryside to see trees! I am generally very excited about trees, so I was definitely not opposed to this idea, and hopped in the car. We drove up near where our college was, did the required walking around, seeing buildings that had been important to us, eating a baby-sized burrito from the local burrito stand, and feeling weirded out by being on campus…Then we ventured out into the farmlands and picked bucketfuls of blueberries to take home and share with all the other city kids so they could have a taste of “wilderness”. Picking the blueberries was fun and we got very muddy (more country to take home to the city! ), and certainly ate a lot of blueberries before they ended up in our buckets. Yum. Here is a photo of some of our bounty: What to do with all these tart juicy blueberries? Bake them into a pie of course! I usually use my dear friend and pie-guru Wilbur’s never-fail crust recipe, but I didn’t have it on hand this time…I braved a cookbook, and found a crust that looked good in Vegan Planet which they use in their Brandy Apple Pie recipe. I made it using white spelt flour, and it came out just right: Buttery, flaky, moist, and delicious. I pricked the bottom crust with a fork half a dozen times, and moved onto the filling. I forgot to measure the amount of blueberries that I used, but basically I just filled up the pie crust till it was nearly overflowing with berries! This was approximately 4 cups of berries. I sprinkled these blueberries with 1/4 cup lemon juice, 1/2 cup sugar, 3/4 tsp. cinnamon, and about 1/4 cup of spelt flour to help it hold together. I piled this mixture inside the crust, making a huge dome, and put a full top crust on top. After pressing the edges together and pricking the top with a fork (in a pretty pattern…We made an “X” but you can choose your own! ), it was time to put this baby in the oven. With the oven preheated to 450 degrees, I stuck the pie in, but immediately turned the temperature down to 350 so the pie gets a blast of heat but the insides get more slowly cooked. Make sure to put your pie on an upper rack of the oven, and a large pan on the rack underneath your pie as a catchment system for any drips. My pie dripped a lot, so we ended up with sweet blueberry syrup that could be poured over ice cream or pancakes. Bake your pie for 50-60 minutes, and take it out when the crust is nicely golden. We let the pie cool for about an hour, and then sliced and ate it with big scoops of vanilla soy ice cream. It was a little goopy when we first ate it, but the next morning the filling had set better. It was delicious for breakfast! I am visiting my brother Jesse and his partner Tara, who live in The Hague, in the Netherlands. I arrived here on Sunday, and Jesse picked me up from the airport in Amsterdam. When we arrived back at their apartment, I was greeted by amazing Tara and beautiful pastries that she had made! They are small pies, or tarts, which are more cupcake sized than pie sized, so we decided they should be called “Cuptarts”. They were absolutely gorgeous, and incredibly tasty too! They had a thick (but light and flaky) gluten-free pistachio crust and were filled with Chocolate Avocado Mousse, and then topped with a variety of fresh fruits. Some even had sugared lavender arranged on the top! They were delightful in presentation and flavor, and they were even portable, so we took them on a little boating trip/picnic the next day. Step 1: Grind raw almonds in a food processor until it reaches almost a “meal” consistency. 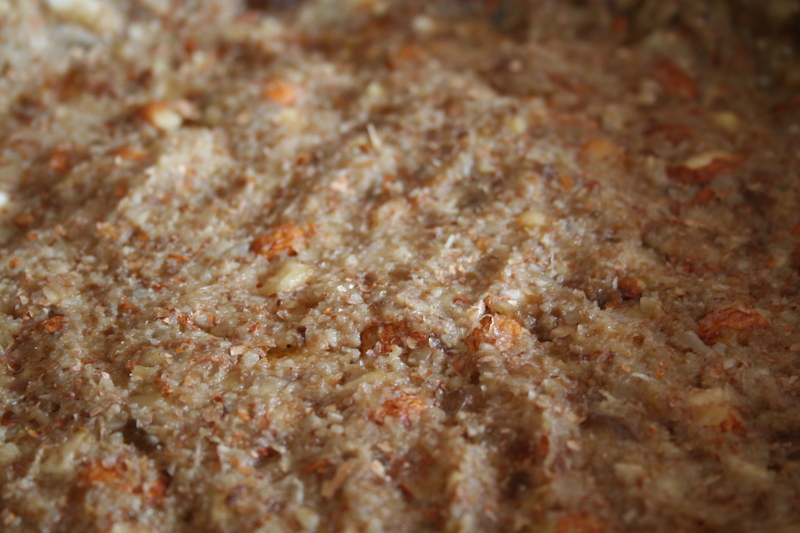 Add pitted and soaked dates, and puree together until it is a good thick paste. Press evenly into your pie pan to form the bottom crust. Step 2: Blend frozen bananas in your food processor or blender, till smooth and thick like frozen yogurt. Pour into your crust and flatten the top with a knife or the back of a large spoon. Step 3: Slice strawberries and layer in a circle shape, with a slice or two of lemon in the center for garnish. Step 4: Put pie in freezer to harden. Remember to take it out about 30 minutes before you want to serve it, and let it sit at room temperature to soften a bit. You want it to still be firm, so the banana filling holds together when you slice it.